Are you looking for an Azores map? I have put a map of Azores below for your convenience. And scroll past the maps for links to a map of each island. 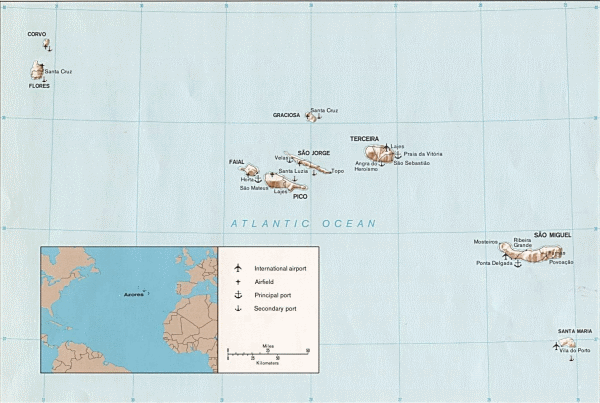 As you can see by the map below, there are nine islands that make up the Azores Archipelago. The Islands to the west are Flores and Corvo. The most eastern (and southern) Islands are Sao Miguel and Santa Maria. And the central group includes Sao Jorge, Pico, Faial, Graciosa, and Terceira. These nine Azores Islands span quite a distance from each other. So if you go to the Azores for a week plan on visiting just one, or maybe two, of the islands. Each island is worth at least a few days on its own. I have been content with two weeks at a time on San Miguel. I have never run out of sights to see and places to explore. This next map allows you to zoom in and scroll around using the tools on the upper left side of the map. And you can zoom out to see the Azores location. These tools allow you to see the map of any part of the islands that you wish to focus on. In the future I will add a link so that you can obtain a map of the Azores to take with you to the islands. If you would like to know about this, or any other updates on the site, please sign up for Azores newsletter. You will also be able to obtain other maps of each island. Leave the Azores Map and visit the Magical Azores Islands home page.